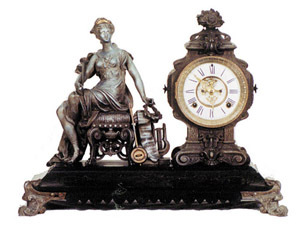 Ansonia Clock Co. figure clock, "Opera", ca 1894. This is a rare model statue, on a large base, unusual tower arrangement. Large 21 inch wide and 16 inch high enameled iron base with etched designs and considerable gold remaining. Old Japanese bronze finish, worn down to the silver. Her bronze crown is bright. 8 day movement, gong strike. 2 piece porcelain dial with open escapement, fancy gold hands, correct pendulum. Note the opera mask, opera names on the banner over the stool, and the trumpet in her hand. Ly-Ansonia No.501.